Connect algebraic equations to real-life situations. Uncover and address misconceptions concerning the meaning of variables in equations. 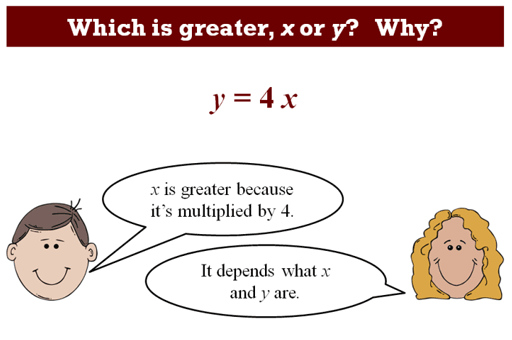 In a whole-class discussion, students consider how the meaning of different equations and expressions changes when the definitions of the variables change. Students then work in small groups (pairs or threes) on a collaborative discussion task, finding word explanations to go alongside the appropriate expressions and equations. Students are encouraged to challenge one another. Finally, students revisit their initial work on the assessment task and work alone on a task similar to the introductory task. Each student will need a copy of the assessment tasks Real-life Equations and Real-life Equations (revisited). Each small group of students will need some plain paper, cut-up copies of the Statements and Equations sheets, a large sheet of paper for making a poster, and a glue stick. 15 minutes before the lesson, a 60-minute lesson, and 20 minutes in a follow-up lesson. The timings given are approximate. Exact timings will depend on the needs of your students.